Content creation- just the words are bound to leave some of us with a feeling of dread and stress. But here’s the deal- you know you need to do it! You know that if you want to get in front of the right audience (you know- the kind that are dying to work with you and pay your premium fees) you absolutely must have a content strategy. Whatever is a small business owner to do to kick the stress to the door and become a content conqueror? 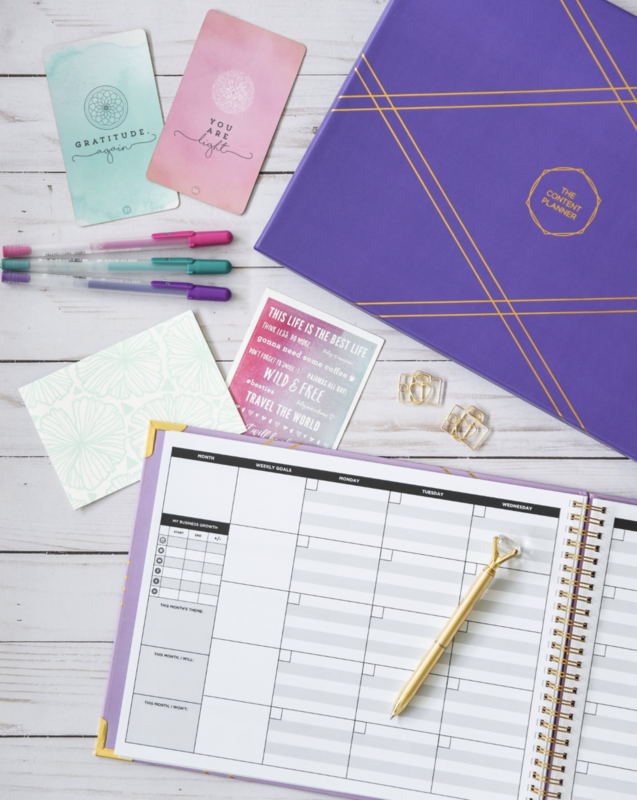 Enter The Content Planner, my absolute favorite tool for keeping me organized and less overwhelmed when it comes to getting my content and new products/service out into the world so people take notice and book my service. Looking for a way to go from content clown to content queen? You’re going to want to get your hands on the content planner! What is The Content Planner? The simplest answer is that it’s a planner to help content creators plan, post, and profit from their content, whether that’s on a blog, YouTube, Instagram, Facebook, etc. But honestly, it’s so much more than that! I use my Content Planner as an editorial calendar for The Decorettes videos, as well as mapping out major content projects (like special offers, course creation, live workshops, etc. ), but I also use it as an overview of my month, where I can quickly see important dates, deadlines, and client bookings. Now let’s get into why you need one! I know there are a lot of planners out there, but The Content Planner is the only planner I know completely dedicated to keeping your content creation organized. This isn’t my day planner (still haven’t found one I totally love, so if you love yours, drop your recommendations in the comments). It is just for my content. Which is a lot! When I’m at full force I have an interior design blog, this blog, a YouTube channel and a website for The Decorettes, digital product creation (both free and paid), different marketing assets that I need to make for myself and my clients (think opt-ins, emails, sales pages), Instagram- and all the design work for my clients as well. I can’t put all of that into my daily calendar! And I also can’t keep track of all every blog post, IG post, or episode ideas I have in my daily planner. Whether you’re a content creating machine, like me, or you are just getting your feet wet (welcome to this fab club!) there is nothing worse than having a brilliant idea and then forgetting what it was or what random post-it you put it on. That’s why I love the dreamspace sections in The Content Planner. If I have a blog post idea, or I’ve seen a Bad Moment in Marketing that I want to highlight on Instagram, I have one, centrally located place for all the ideas! I also use the dreamspace to break down those big, scary projects into actionable steps for me to work on. For instance, right now I’m in the middle of not only refreshing this website, but I also plan on launching a new free eBook on web design soom, as well as fully launch my StoryBrand marketing and design services. That may sound like a gigantic task (which it is) but in the dreamspace I’m able to braindump everything that needs to be done, put them into a logical order, and then get to work! I love how I now have everything in one place! If you’ve been to one of my quarterly Content Planning Workshops, you know I’m obsessed with fully planning out each quarter. That’s why I was so excited to see that The Content Planner now has a yearly spread. So now after every quarter’s planning session, I can fill in everything that needs to get done, when products are launching, when client’s have booked with me, any conferences I’m attending. It helps my overwhelmed brain calm down! I’m a huge believer in working on a few, meaningful, strategic goals each month, rather than run myself to thin and make no progress on anything. And while I’m sure we all make monthly goals, have a place where it’s written down keeps them top of mind when shiny-object syndrome kicks in and we feel like working on something else. Studies also have shown that when you write your goals down, you are more likely to reach them. (No- I don’t remember what study showed this- please don’t make me cite sources). At the beginning of each month’s spread there’s space to write down your goals for the month. Like I said- everything is in one place! What else needs to be in one place? Your content! Never forget to post again! While I believe that the essentials of a well-designed brand are a clear message, captivating visuals, and marketing materials meant to convert (think website, opt-ins, emails, sales pages) how are people going to know you exist? If you think you can get by with just having your web pages optimized on the backend for search engines for web traffic, you’re wrong. People will find your site from blog posts, Pinterest graphics, Instagram posts, YouTube videos, even ads, if that’s your thing. 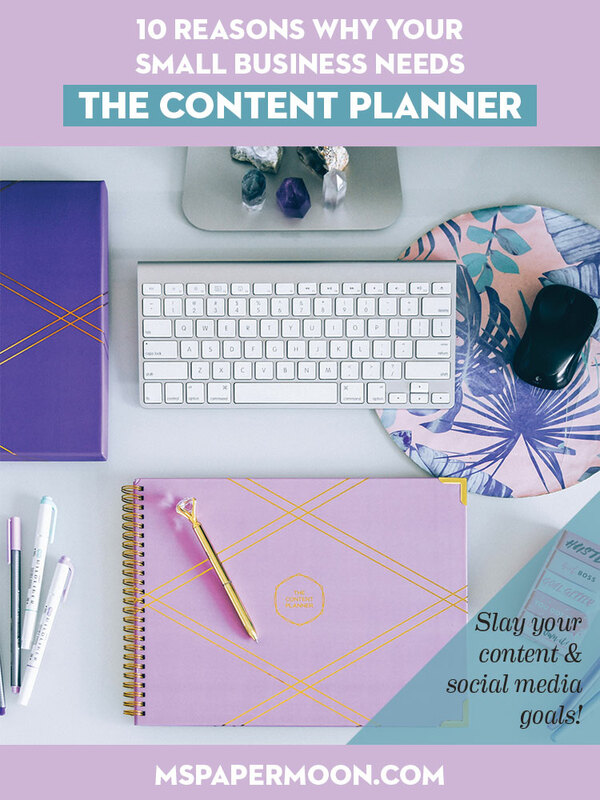 And The Content Planner is the only planner I know of that is specifically meant to help you keep your content and editorial calendar organized in a way so you stay on top of posting. And that content is meant to help your business grow. Spewing out content for content’’s sake is a thing of the past. You need to make sure that the content your create for your small business is getting you somewhere by way of new followers, new leads, and more revenue. I love having the growths tracker at the beginning of each month so I can reflect on what worked and what didn’t. If my numbers went down, I know I did something that didn’t work and to try something new. And if my numbers increased, I can look back and see what I did differently so I can do more of it. I know a lot of us keep a hashtag list on our phones. And we use the same ones. At the beginning of every monthly spread of The Content Planner there is a hashtags space- this forces me to refresh and research new hashtags to try during the month. If you’re finding that your hashtag list is getting a little stale, I highly recommend forcing yourself every month to search out some new possibilities. I’m new to this one, and honestly, I didn’t know how to use The Content Planner’s Hit List section before Kat Gaskin’s recent #planherchallenge (FYI- she created The Content Planner). In short, this is a list of brands and accounts I’d like to work with in the future. If they’re product based, I know I need to plan some content with their products. If they’re an account I’d like to work with, I know to keep close attention on their posts and constantly engage with them. I’m excited to use the Hit Lists feature at the beginning of each monthly spread this year. I’ve always done this subconsciously, but now I have a place to keep organized and focused. Studies also show (no- I still don’t remember which one!) that we shouldn’t just celebrate our big wins; we should also celebrate the small wins. If we wait to celebrate only the big wins, we might be waiting a very long time before we do any celebrating. And I like to celebrate! At the end of each week in the monthly spread of The Content Planner there’s a little space to write down your wins for each week. This may be a small feature, but it has a huge benefit. I love looking back on the week when I’m tired and possibly feeling a tad stressed about everything that I still need to do to look back and recognize what good things happened during the week. This could be something small, like 2 new YouTube subscribers (which I’m always immensely thankful for), or something larger, like signing on a new client. We’ve all been there. I don’t know of anyone who’s had times in the content creation where inspiration just wasn’t coming of things feel stagnant. Well, The Content Planner has some help for you! If you’re ever wanting some fresh ideas for new content, just hop over to the monthly theme ideas or list of nation and international social media days. While not everything may applied to your business and audience, there’s bound to be some new content ideas that your ideal followers and clients will love! See- content creation can be a lot simpler to wrap your head around than you may have thought! You’re business deserves to get it’s message out into the world so peoples’ lives can be made better from your products and services. All you need is The Content Planner to plan it, post it, and profit to start seeing results. Now get to work, Goal Slayer! All images courtesy of The Content Planner! Boldly Go Where No Brand Has Gone Before! get your brand's message noticed in a universe filled with noise with your brand launch plan!